Facebook, the giant of the social media platform, is widely used to share our daily happenings, pictures and videos with others. They also provide the Chat feature to its members, were the users can send and receive messages to any particular person in real time. If we talk about the privacy of this chat feature, they haven’t disappointed the users by any mean. While chatting with others, we always have an option, to become invisible, partially or completely. In simple words, Facebook chat privacy settings, allow the users to block anybody, everybody or selected users from the chatting, temporarily or permanently. In extraordinary cases, you always have an option to permanently block any particular user, to see your Facebook presence / activity altogether. Now you maybe wondering, if this activity will get noticed by the person, you are wishing to block. Although, there are few indicating elements, mainly it’s difficult to figure out for any normal Facebook user, not for the readers of this blog 🙂 . Yes, we are going to discuss the same today, about How to Check, If Somebody has Blocked You on Facebook Chat. First of all, you have to understand the Facebook chat completely. 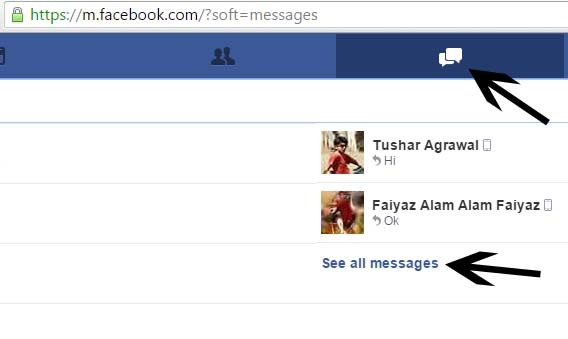 Only the desktop version of the Facebook chat provides the ability to turn off the Chat completely OR only for the certain selected users. In the mobile version of the Facebook chat, you only have the option to turn the chat to ON or OFF. Generally, you will see a bold green dot beside the user name, if the user is avalable for chat, if this green dot is unavailable, the user is unavailable too. 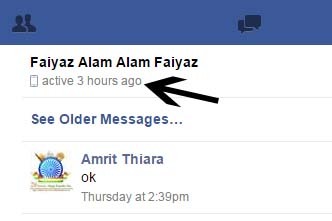 Many of the times, you may see the “last active time” beside the user name, which actually is normal. Here comes the main worries, when you feel that the person has blocked you to see his online presence, for whatever reason. Do you have any option to confirm your feeling ?, If not, be patience, today you will surely get the way to confirm your beliefs. First, you have to understand the complete procedures to blocking somebody on both the Facebook platforms, the desktop and the mobile version. How to Block selected user / users OR everybody in the desktop version of the Facebook. 1)- Go to http://www.facebook.com and get into your Facebook account. 2)- Here, you will see the Chat Window in right of the screen. 3)- Now, in the bottom of the Chat Windows, look for the “Options” button, Click to open the complete “Options” menu. 4)- From the opened “Options” menu, select and click, Advanced Settings. 5)- Now, you will be with “Advanced Chat Settings” window. Here, you will get 3 option, which are explained below. Turn off chat for only some friends: This option is to turn off the chat for any single or selected user. Just put their names in the box and you will be invisible for them. Off course yes, you can revert it back anytime. 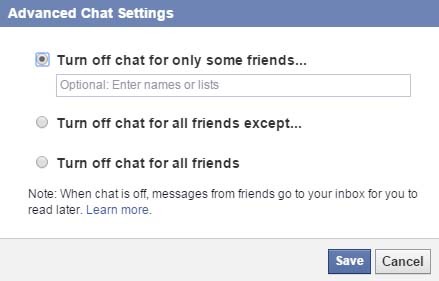 Turn off chat for all friends except: You can use this option, if you want to be available for some users and unavailable for all. 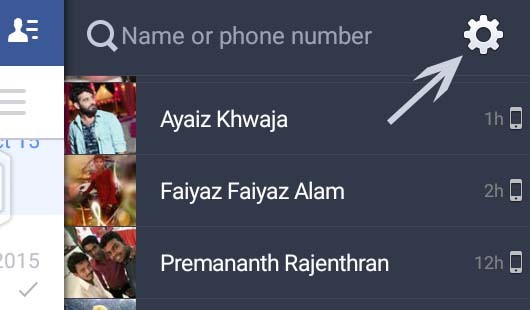 Turn off chat for all friends: As the name suggest, it will make you invisible for everybody, technically it will turn off the chat completely. You will not be available for anybody. We hope you have understood the blocking thing completely, Any of your friend may has used the option(a) to get invisible for you 🙂 . Don’t worry, at the end of this post, you will be able to see him with your naked eyes. 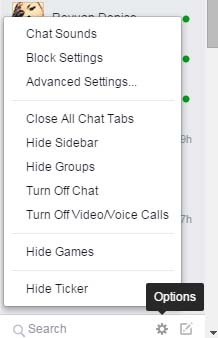 Let’s move to the next section, turning the chat ON or OFF in the mobile version of the Facebook chat and Facebook messenger mobile app, as we don’t have these custom options there. 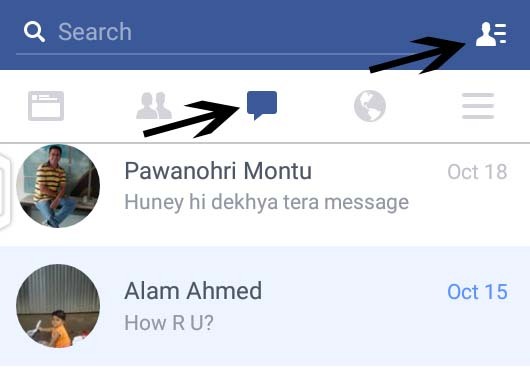 How to turn the chat to ON or OFF in mobile version of the Facebook. 1)- Open the Facebook mobile app. 2)- Now, go the the “message” section at TOP, in the middle. 3)- Now Tap to the menu button (top-right). 4)- Now click the setting wheel (top-right). 5)- Here, you will be with the option to turn the mobile chat to ON or OFF. 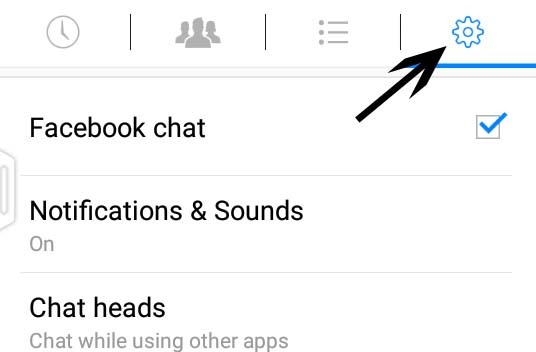 How to turn the chat to ON or OFF Facebook Messenger mobile app. 1)- Open the Facebook messenger mobile app. 2)- Now, look for the settings wheel (top-right) and TAP it. Important: Make sure that you have gone through with both the mobile app steps otherwise there will be the strong indications for your online presence to other users. In simple words, if anybody is using both the Facebook mobile apps, He/ She has to disable the Facebook chat in both the mobile apps, to get invisible for everybody. We hope, the blocking thing now has been clear for everybody. Oh yes, let’s move to the main section, for which this post is all about, and for the reason you people are reading this with a lot of curiosity 🙂 . As discussed earlier, there is no customs options for blocking in the mobile version of Facebook apps. This mean, the people will never block you in the mobile version, as if they try, they will get invisible for all others too 🙂 . If anybody has done that, it’s for everybody and normal too. 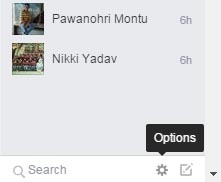 In the case of desktop / web version of the Facebook Chat, with all the custom settings, anybody can do that with you. Here, the main thing for the worry is your reputation. For what the HELL reason, he / she has blocked especially you. It would be a better option, if that person has thrown you out using the un-friend option, at least the intentions were clear. 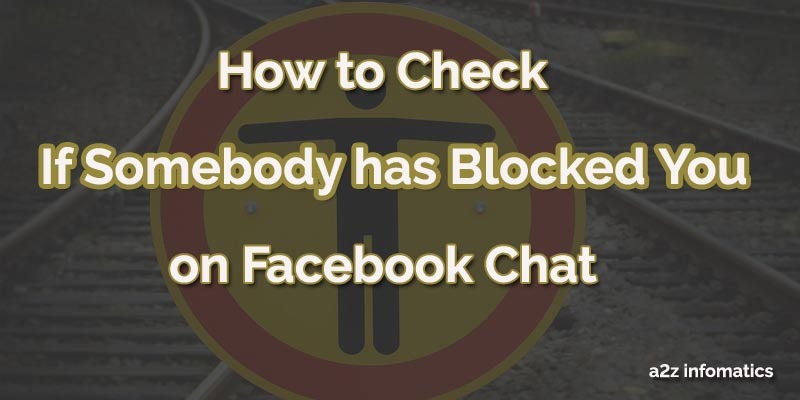 Don’t worry below are the steps to check the hidden intentions of the people, who had blocked especially you, using the custom block settings in Facebook Chat. Steps to check if You have been Blocked on Facebook Chat. 1)- Open http://m.facebook.com OR http://mbasic.facebook.com in any preferred web browser. 2)- Look for the Message section (top-center). Click it to get inside. 4)- Once you get to the previous messages of that doubtful person, Open it to get inside. 5)- Now, look at the TOP of the Window, under the person’s name. You may get his “last active” time OR you can see him “Active“. You may see “on mobile” under the name, which means that the person is using Facebook on the mobile app and currently is logged out. We hope you have understood the whole investigation process 🙂 . Don’t ask that person to give any appropriate reason for this act. You just have to understand that he / she is not interested to talk with you 🙂 . Things to remember for any mis understandings. If you are unable to see the “last active” time beside the user name, don’t assume that you have been blocked, the user may have logged out from all the Facebook platforms, in majority of the cases it’s normal. You can use Ticker to find the user’s online activity. Actually these Tickers, disclose all user’s activity in the real-time. In the case, anybody has blocked you, using Ticker you can monitor user’s post like and commenting to the post type activities easily. Using the “message seen” feature, in the case of any doubt, just send a message to the doubtful user. There are chances that you will get this “message seen” notification (double tick mark against the message) from the user, who is showing offline to you. You may also like: How to Check If Somebody has Blocked You on WhatsApp. We hope, everybody has enjoyed this investigation to find, if you have been blocked by any of the Facebook user. We never understand, why people opt these ways against their friends or relatives. Well, it’s their wish, maybe they are going through with any mental trauma, God Bless them. That’s all we have related to the investigation, we will be back with many more. Till then, Good Bye. Take good care of the friends, who have blocked you without any reason. Thanks for the readings and keep visiting a2z infomatics, we are nothing without you.